I often like experimenting w/ food from other cultures, and tonight's dinner was no exception. My modifications are based on experiments. 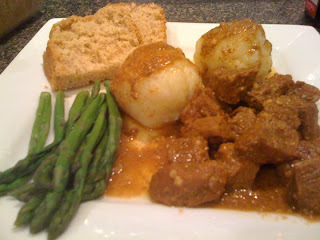 If you want the beef paprika to turn out yummy, here's how to make it happen! Any time I make it, I make it in the crockpot. It gives the meat so much tenderness, and I don't even have to brown the meat! I mix the sauce together and pour over 8 ounces of beef stew meat and cook on high for about 6 hours. Sometimes I will take some of the leftover sauce, and will whisk in some flour to make a gravy, and will serve the meat and gravy on top of boiled egg noodles or spaetzle. This is a great dish for those nippy fall or winter evenings! The Beer bread is out of this world EASY! All you have to do is use a quality beer - I've used both Yuengling black & tan, Sam Adams Cherry Wheat, Ybor Gold (a local brew), Honey Ale, and most recently used a Pale Winter Abbey Ale which gave a malty toffee taste to the bread. I have tweaked it to suit my preferences using 1/3 cup of sugar, and given I RARELY (if ever) have self rising flour on hand, I simply use 3 cups of regular flour, and 3 Tbsp + 1 1/2 tsp baking powder, and 1 Tbsp salt. This bread is wicked good!! !